Are you looking for a movie that will make you laugh and swoon? 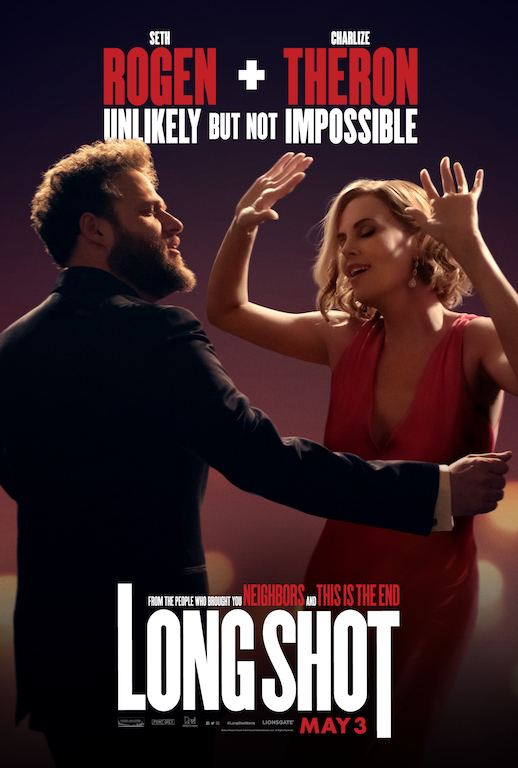 Long Shot, starring Charlize Theron and Seth Rogen hits theaters May 3! Look at them, would you? I know Long Shot one has the possibility of being cheesy and derpy, and I’m here for it. The premise of the film has been done before (beautiful, unattainable woman falls for not-as-attractive dude), but that’s okay. It’s a rom-com trope, just like a vacation romance or a meet cute at a coffee shop. We buy into these stories because they’re ones we want to see. With great writing, you can take a trope and make it your own, and that seems to be what Rogen and Evan Goldberg have done here. One of the things that drew me to this film, was the obvious chemistry between Theron and Rogen. The trailers aren’t long, y’all, but they made me grin like an idiot. This is the content I want in my life: love stories that have obstacles that can and will be overcome. Another big draw for me was the backdrop of the story. Charlize Theron plays Charlotte Field. She’s the current Secretary of State, eyeing a Presidential run. While Rogen is Fred Flarsky, a journalist turned speech writer for Field. Oh, and she used to babysit him when they were younger. Yes, you read that right. It has a side of political intrigue and “we used to know each other” romance! Throw in a supporting cast that’s stellar, and this film seems like a solid bet. I already what the gif of Theron’s assistant saying, “I feel so scared.” so I can use it whenever I want. Watch the trailers now and get ready to fall in love!